This book highlights the display applications of c-axis aligned crystalline indium–gallium–zinc oxide (CAAC-IGZO), a new class of oxide material that challenges the dominance of silicon in the field of thin film semiconductor devices. It is an enabler for displays with high resolution and low power consumption, as well as high-productivity manufacturing. 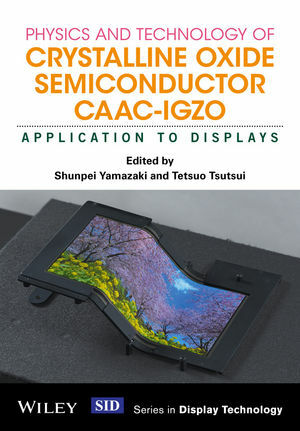 The applications of CAAC-IGZO focus on liquid crystal displays (LCDs) with extremely low power consumption for mobile applications, and high-resolution and flexible organic light-emitting diode (OLED) displays, and present a large number of prototypes developed at the Semiconductor Energy Laboratory. In particular, the description of LCDs includes how CAAC-IGZO enables LCDs with extremely low refresh rate that provides ultra-low power consumption in a wide range of use cases. Moreover, this book also offers the latest data of IGZO. The IGZO has recently achieved a mobility of 65.5 cm2}V-s, and it is expected to potentially exceed 100 cm2}V-s as high as that of LTPS. A further two books in the series will describe the fundamentals of CAAC-IGZO, and the application to LSI devices. • Introduces different oxide semiconductor field-effect transistor designs and their impact on the reliability and performance of LCDs and OLED displays, both in pixel and panel-integrated driving circuits. • Reviews fundamentals and presents device architectures for high-performance and flexible OLED displays, their circuit designs, and oxide semiconductors as an enabling technology. • Explains how oxide semiconductor thin-film transistors drastically can improve resolution and lower power consumption of LCDs. Dr. Shunpei Yamazaki is an authority on semiconductors, memory devices, and liquid crystal displays. Listed on over 4,000 US utility patents, Dr. Yamazaki was named in the Guinness Book of World Records as holding the most patents in the world; hailed the most prolific inventor in history by USA Today (in 2005). His most notable work is on the thin-film transistor -- a significant discovery being a crystalline structure in Indium gallium zinc oxide (IGZO) material, which he discovered "by chance" in 2009. Today Dr. Yamazaki is President of the Semiconductor Energy Laboratory (SEL), where he and his team pioneered the unique development of ultra-low-power devices using CAAC-IGZO technology. A joint venture with the Sharp Corporation manufacturing smartphones using crystalline oxide semiconductors (IGZO) is a global first. In 2015 Dr.Yamazaki received the SID (Society for Information Display) Special Recognition Award for "discovering CAAC-IGZO semiconductors, leading its practical application, and paving the way to next-generation displays." His paper on CAAC-IGZO ranked in the top 15 most downloaded papers of Wiley Electrical Engineering and Communications Technology journals, 2014. Dr. Yamazaki is also an IEEE Life Fellow. Tetsuo Tsutsui received his BS (1967) and MS (1969) in Applied Chemistry from Kyushu University, Japan, and Dr. of Engineering in Materials Science from Graduate School of Engineering Sciences of the same university in 1977. He was a professor at Graduate School of Engineering Sciences, Kyushu University from 1986 to 2008. His research interests were electronic and optical properties of molecular solids and organic semiconductor electronics, including organic light-emitting diodes, organic FETs, and organic photovoltaic devices. He has published more than 200 original and 50 review papers. He received The Polymer Society Award (Polymer Society, Japan, 1995), Chemical Society of Japan Award (2008), Medal with Purple Ribbon (Cabinet Office of the Japanese Government, 2009), and Jan Rajchman Prize (Society for Information Displays, 2011). He is a Fellow of Japan Society of Applied Physics and a Professor Emeritus, Kyushu University.